There’s a reason stylish women have at least one “little black dress” as a wardrobe staple. It’s the same reason that formal tuxedos are midnight black. There simply is no match for the style and grace associated with this hue. 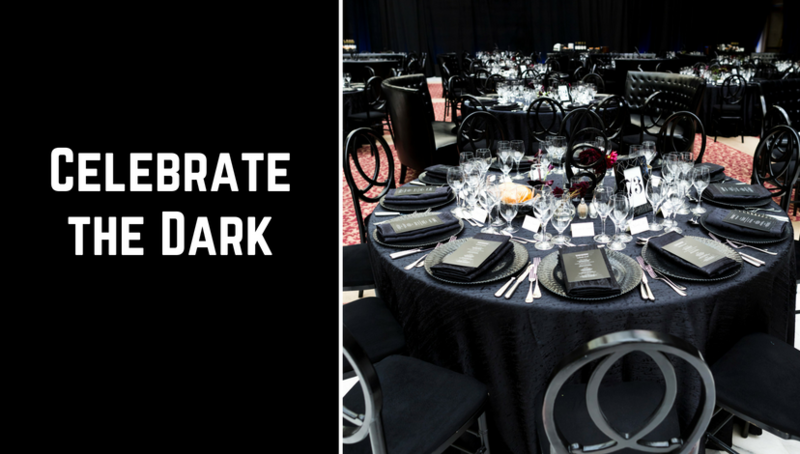 In combination with other colors, black always is a star, but using black alone can establish an elegant mood and allow the guests themselves to take center stage. 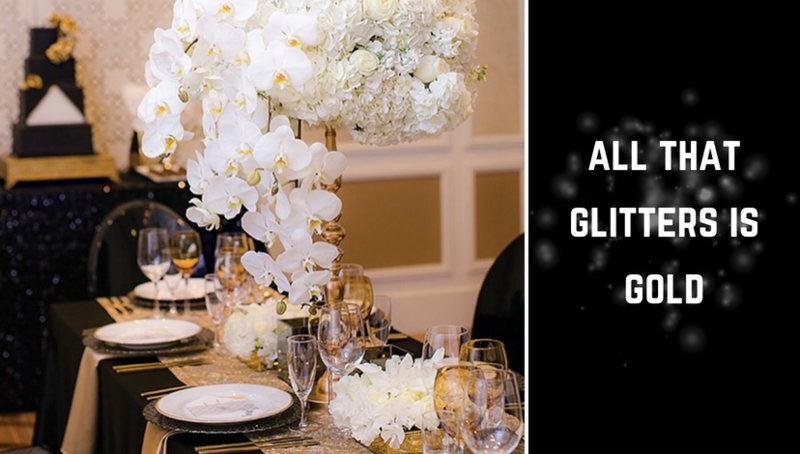 There’s nothing at all somber about this formal setting; instead it sparkles with a unique aura, and presents a luxurious stage for a posh event. Minimal white accents, the sparkle of glassware and the surprise of a colorful floor covering add all the drama that’s needed. Tasty food and scintillating conversation will no doubt dominate, and that’s as it should be! What a rich combination. Set the bar high for elegance with this trio of formal favorites. It will always be a winner! 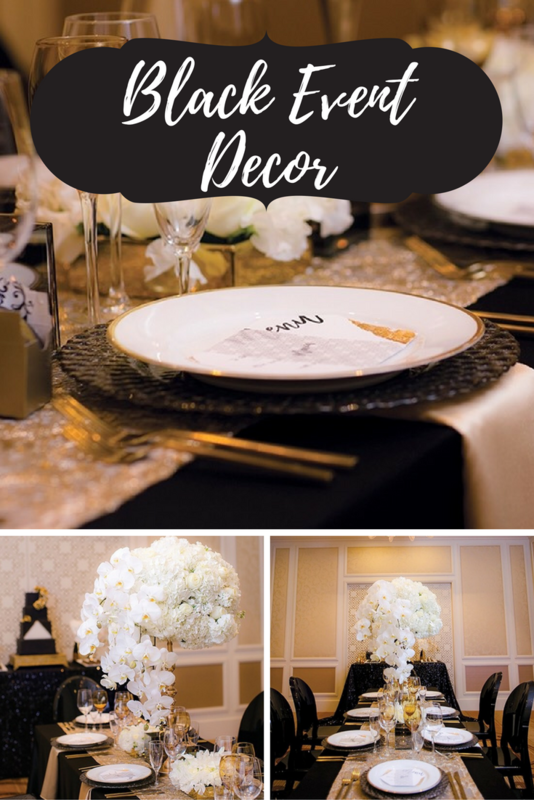 Score a “perfect 10” with a solid black cloth topped by a sheer golden filigree patterned runner and pale taupe silky napkins. 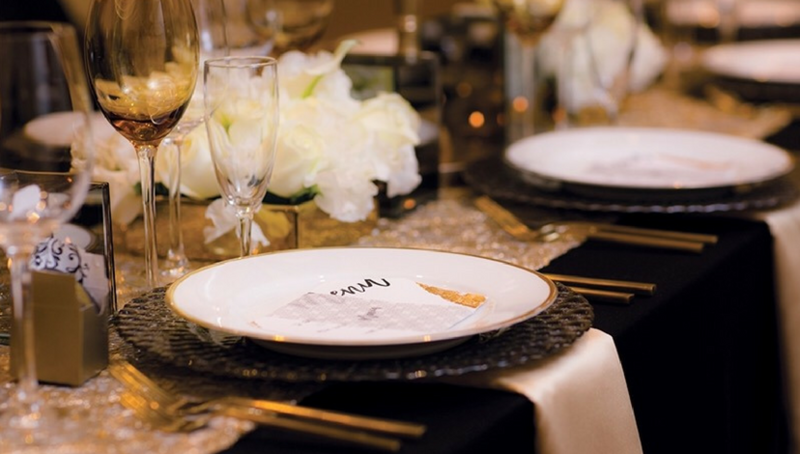 China and flatware reinforce the theme, and white flowers add the perfect measure of refinement. 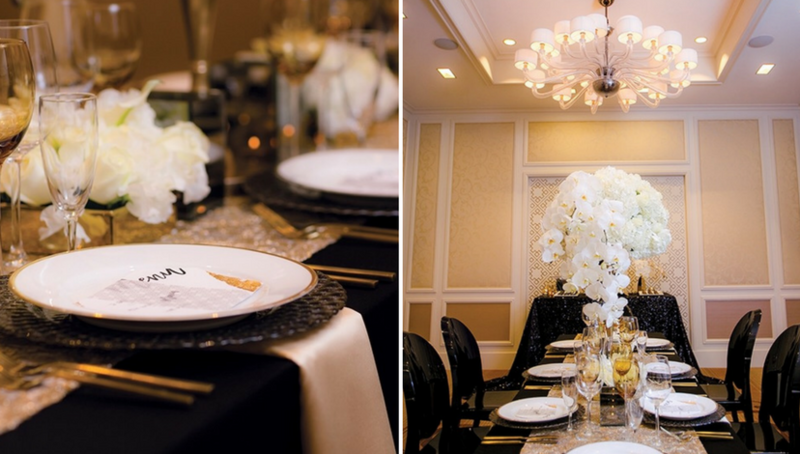 In a gold-toned room, the contrast of black and white is as opulent as a string of pearls on black silk. The combination is never stark, and the abundance of gold reinforces tradition and class, even as it softens the contrast. 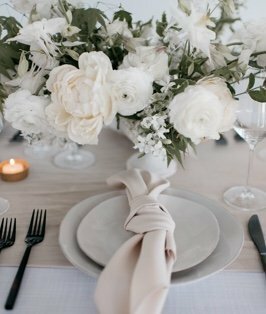 Snowy white floral arrangements steal the show, and the varied types of blooms add lighthearted elegance. There is nothing off-putting about this kind of formality. As your eye travels around the room, there is always something wonderful to focus on. 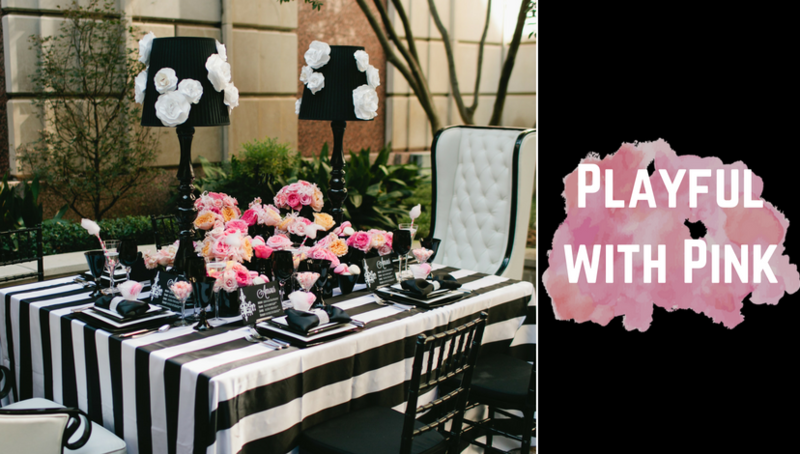 Set a patio table with a decidedly deco style to-the-floor drape of white floral on a black ground. 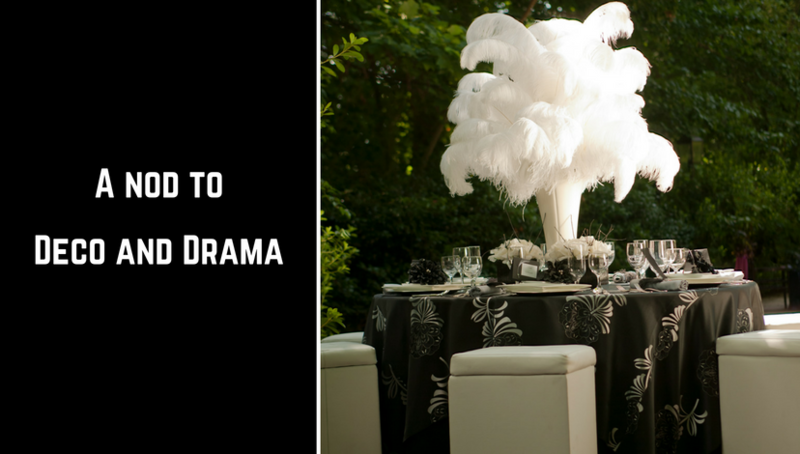 Add a larger than life feather centerpiece to play up the theme, and keep table settings low-key in black and white. Pull up upholstered cubes for comfortable seating and you’ll win accolades for the party of the season. Take a bow! 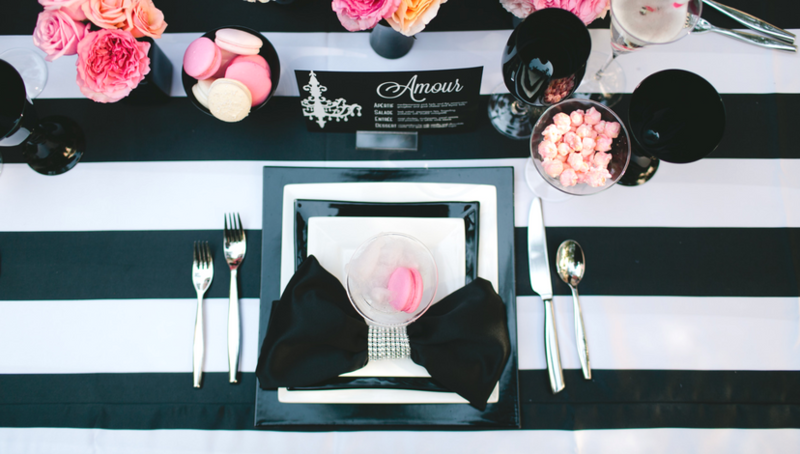 As charming as a Mad Hatter Tea Party, the black and white theme for this unabashedly frivolous setting pairs a wide black and white striped cloth with imaginative accessories for a storybook effect. Tufted leather and black seating with a contemporary vibe, embellished lampshades, and a wild display of posies in bright lipstick tones can’t help but bring smiles and promote good cheer. 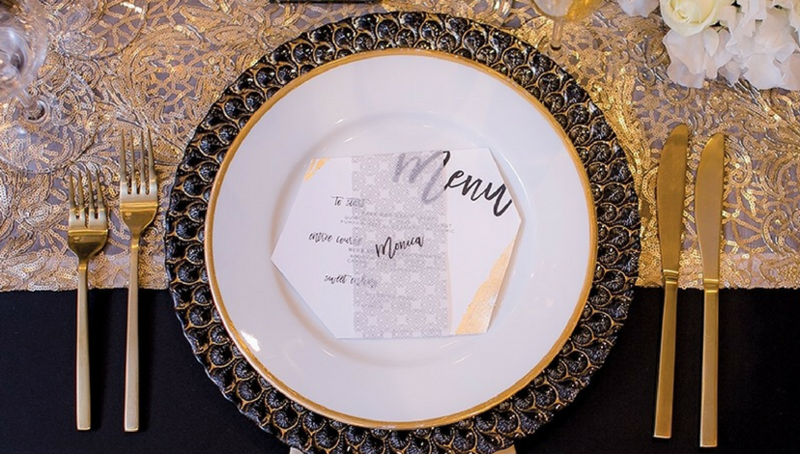 The square dinnerware repeats the stripes, while a rhinestone napkin ring conjures up visions of Audrey Hepburn at her best — and most bold! Candies and mints are pretty in pink, and testify that “love abides here.” Who wouldn’t want to attend this party?